The boards come with a double concave bottom with probably the deepest concaves nr-01 (5,5 – 6mm depth) ever used on new age wave boards. The deepest part of the concaves has been moved right underneath the standing area. The deep concaves enabled Werner Gnigler to create a very long flat sectionnr-02 under the straps. This makes the boards plane early and accelerate to high speed when sailed flat. At the same time the concaves allowed for a curvy bottom line in the rails with almost no flat sectionnr-03. So when you rail the board up this feature really comes into play and you will experience incredible turning and a new unknown riding sensation. The brand-new wingersnr-04 make the board’s tail slightly wider in front of the rear strap, providing more surface area and early planing. Behind the winger the radically narrow and thin tail allows super radical turns and you can tighten your turn whenever you feel like it. In the thruster setup they are perfect for conditions where you need a fast, early planing, powerful board that turns well and launches into the sky like a rocket. 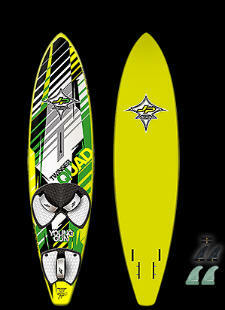 In the quad setup you get a board that is super loose and provides radical turning and heaps of control on the wave. So you can shift the focus from an onshore rocket to a side shore ripping machine. 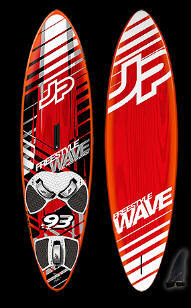 This suits our riders on the PWA tour as well as any wave rider wanting a versatile wave board. They are relatively long which gives them great early planing and top end control. Their overall width and rather wide tails make them accelerate fast and go well upwind. Landing big jumps and staying on the plane is easy. They come with a rather flat rocker between the straps and a little tail kick. The double concave bottom runs into a progressive Vee towards the tail producing additional bottom curve in the rail. 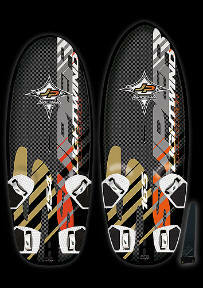 This and the additional outline curve between the straps make the boards faster and more maneuverable at the same time. Fast bottom turns or tight turns aiming for the pocket, they offer it all. The thin rails bite determinedly and maintain the grip during down-the-line carving bottom turns. The ergonomic deck shape provides a comfortable stance and responsive rail changing. The wide stance allows the rider to tighten turns easily via the back foot and to ride the wave via the front foot. Gusts just make the boards want to go faster. No speed limit holds you back on massive jumps or blasting in bump and jump conditions. They allow you to ride with power and speed already in moderate winds. Sufficient tail thickness creates a rounder constant dome at the deck and a very comfortable stance no matter if your foot is close to the rail or more towards the center line. The rail radius is thin and sharp to offer great grip in the turns. The outline is drawn out around the tail and straighter between the straps, adding planing surface for better low end performance and additional pop. This also creates a longer rail line offering more control in high. The straps are rather far back allowing you to use the fuller outline radius for snappy turns by pushing on the back foot. It also creates additional speed in longer turns when applying more pressure on the front foot. The bottom is equipped with a constant Vee and double concaves running through. The flat bottom curve in the concaves delivers great early planing and speed while lots of bottom curve in the rail line provides good maneuverability. The double concaves under the mast base cushion the ride over chop. The 85, 93 and the all new 102 also come with double concaves in the nose for an even smoother ride especially when conditions get really rough. 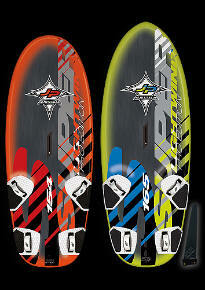 Sporty multipurpose boards between Freestyle Wave and Super Sport. They are easy planing, comfortable to ride and go really fast. Easy and forgiving medium wind jibing boards. They deliver an exciting, electric feeling when going fast. 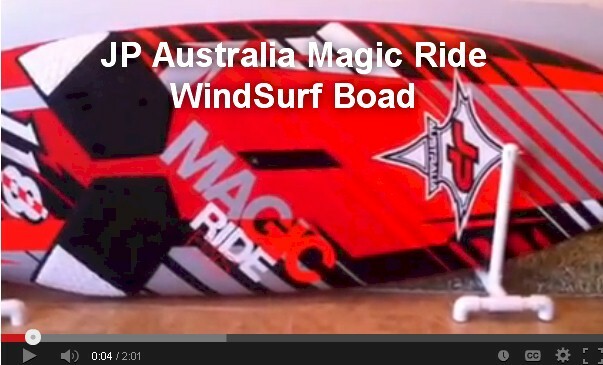 Plug and play windsurfing – jump on and have fun. This year we redesigned the 106, the size which covers it all. The old 106 was a very popular shape and it was very difficult to create an even more perfect all-rounder. We feel that we have achieved this objective with the 106 II. We kept the basic dimensions but used a more parallel outline in the midsection of the board. This offers more planing surface around the mast base area and therefore lifts the board onto the plane effortlessly. This also improves the stability when non planing or during tacking. Once planing, the additional outline curve towards the tail lets the board fly over chop. This loose water position makes it easy for riders of all levels to exploit its outstanding performance potential. Another big advantage of the new outline is the improved maneuverability. You can turn the board at any radius depending where you shift your weight and which part of the outline you use to carve. The new 106II is just a bit better in everything and is great fun to ride. The very popular 96 and 116 are unchanged and still come with the proven channel bottom concept which provides great performance (early planing, high speed) and excellent maneuverability as the rail line has more bottom curve than the inside area of the channel. The channel edge also creates extra lift and grip for maneuvers. 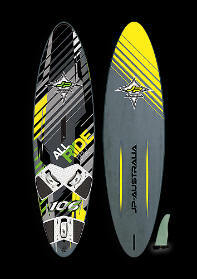 Thrilling and exciting extra wide, short and thin freeride boards. They feature unbelievable early planing with the easiest jibing possible. The main difference to boards from our competition is, that they really give you an electrifying feel which you normally only get from much smaller boards. Their early planing and top speed are also unmatched in their class. Shaper Werner Gnigler took a lot of features from the Freestyle Wave boards. The thin rails in combination with the low overall thickness make them such outstanding easy jibers. They pretty much jibe by themselves. Push the rail and they will carve the same radius every time – smooth and easy. Obviously, the thin rails also provide great grip for more sporty jibes. If your jibes are not perfect yet and you sometimes make little mistakes – no problem the Magic Rides will simply finish the jibe for you by keeping the same radius. The wide body concept creates ease, comfort and stability. This in combination with the special rocker line probably makes the boards the ultimate in passive planing today. You don‘t need to pump or use a special technique to get them onto a plane. Just sheet in and enjoy! Their planing power is not limited to big sails. They jump on the plane effortlessly – even with rather small sails. Super easy to get going and get into the straps! They accelerate quickly to a convincing pace which is easy to handle and controllable at all times. And they never seem to stop planing! As this concept is so popular we now offer an additional 111 as well as extra technology versions. Their amazing maneuverability and their reliability to carve steady arcs will inspire the advanced riders to try some classic freestyle moves. Short and wide boards often run into control problems in choppy conditions. Not the Magic Rides as the maximum width is slightly in front of the center resulting in a smooth and even outline which provides great control at high speed. They will feel like the smallest boards of this width that you have ever sailed. The name X-Cite Ride became a trademark for comfortable and sporty freeriding. Outstanding test reports have confirmed this. The X-Cite Ride PLUS range still follows this concept. With the introduction of the super easy Magic Ride boards we decided to slightly re-position the X-Cite Rides and make them even sportier. So the PLUS in the name stands for improved overall performance and for the fact that Generation 6 is sportier than ever whilst still being easy to handle. The even deck radius results in a comfortable stance and the thick foot pads complete the comfort package. Towards the tail, the outline is pulled-in which results in additional outline curve which helps to improve the maneuverability. Once the rail is set it carves a smooth stable arc, keeping plenty of speed for the jibe exit. You can jibe these boards at any radius you like. The Super Sports deliver slalom race-like performance but are way easier to ride and control. Great market feedback and lots of test wins have confirmed that. 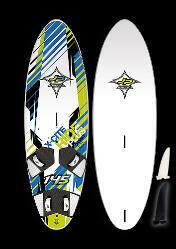 The line combines shape features from the X-Cite Ride and the Slalom boards to offer the best of both worlds. To make them seriously fast Werner Gnigler used his experience from the Slalom developments while the influence of his X-Cite Ride shapes make sure that the power of the Super Sports is easily accessible for every advanced rider. The reduced overall length gives the boards a lively feel. The volume distribution is very balanced throughout the board which is an essential feature needed for early planing and effortless riding. The boards come with a raised deck in the foot strap area combined with a round and constant deck curve in the whole standing area. This makes the stance very comfortable and you‘ll stay connected to the board at all times. The bottom is equipped with a double concave V in the front flowing into a flat V towards the tail, ending with cut-outs. The concaves work like suspensions when the board hits chop. The flat V supported by the tail cut-outs have the best and most efficient water release resulting in top speed on every course. 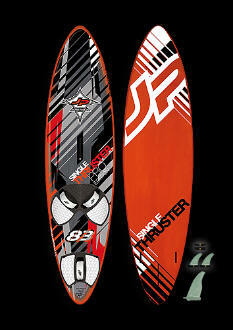 The cut-outs also take some pressure off the tail keeping the board flat on the water – even in the strongest gusts. The outline is kept rather parallel especially at the rear of the board resulting in a powerful stance with even pressure on both feet. Towards the front, the full rail radius creates buoyancy when not planing and balanced lift during carving maneuvers in which the board glides through the jibe on its rail. 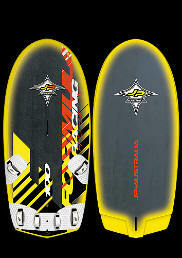 The fins supplied with the boards are probably the best performing Powerbox fins you can get. First introduced in 2010, the name ‘Super Lightwind’ stands for a unique concept. 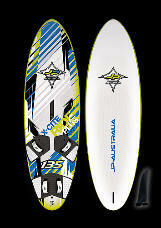 We wanted to cover the light wind segment by offering a user-friendly board with outstanding early planing performance. 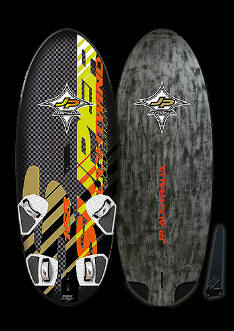 This brand new board combines the two concepts that we offered in the past. 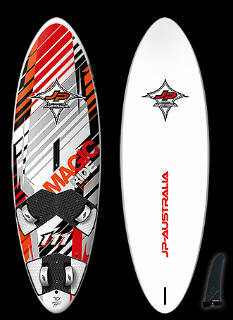 One shape covers it all, maximum light wind planing ability, easy handling and an electrifying sensation of speed. 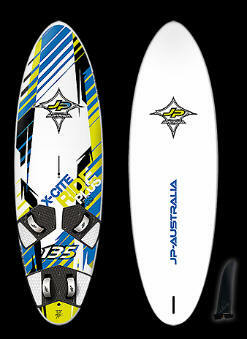 All the knowledge from the latest Super Sport, Slalom and Formula development went into the design. The dimensions 245cm x 91cm fit exactly in between the two previous models. The perfect length for great stability and neutral water position so you can get the board onto the plane without an active sailing style. The special volume distribution is also very important as it allows you to get planing with hardly any white caps in sight. The outline is pulled-in towards the tail but rather parallel throughout the mid-section of the board maintaining the maximum planing surface around the mast base area. The rather narrow tail makes it easy to get your feet into the straps it also gives the board a very loose feel which makes you believe that you are riding and jibing a much smaller board. For maximum control we copied the tail shape from the latest Slalom boards. It features a winger design, which makes the deck outline wider than the bottom outline. This allows the rider to have a more outboard stance producing lots of power in light winds and maximum control and comfort on long runs. The deck shape with its constant radius offers a comfortable and powerful stance in the outboard and inboard strap positions. For the bottom shape we chose the most efficient concept where the ‘V flow’ increases constantly towards the tail which is the same as we use in our Slalom and Formula boards. This gives the rider the sensation of flying over the water’s surface and not the feeling of pushing the board through the water. For that daredevil inside you! There is nothing like the feeling of flying down a speed course totally maxed out and being right on the edge. This is what these boards are made for. They are designed and developed for those who have the guts to put the pedal to the metal and go for it. 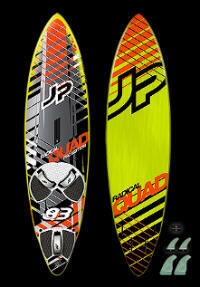 They have rocket-like acceleration, feel super loose on the water and reach unbelievable, almost unlimited top speed. Take the biggest sail you can possibly hold, sheet in and have lots of fun, and have faith in the knowledge that you will stay in control even at the highest of speeds. These boards have no limits and will go as fast as you dare to go. 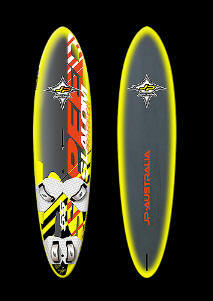 The Speed Slalom offers a great combination between a light wind speed board and a full-on slalom race board. It features a double concave front section with soft tuck rail for a smooth ride over chop. This makes the boards immune from getting pushed off course by side chop. Towards the tail the bottom transforms into a flat V, which increases slightly towards the tail. This produces minimum drag and gives the board that loose feel. We developed this one by merging the former Power and Speed Formula boards. In choppy conditions you constantly need to trim and level out the board in order to get maximum speed. 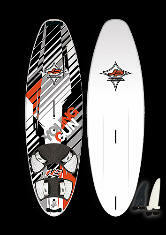 We added some outline curve in the tail making it easier to find the ideal water position of the board. Due to this outline it feels looser under your feet, so it is easy to keep it ‘flying’. It powers up straight away and flies over the fin. It is so balanced and well trimmed that it is easy to keep the pressure on the fin and soar upwind. The wide tail creates plenty of power that is instantly converted into lift to further help with upwind sailing. At the same time it‘s easy to release all that power and transfer it into maximum speed. We achieved this with a progressive bottom V-flow that also makes it accelerate to unknown speeds on the downwind course. It also takes pressure off your legs making it easy to handle all this lift, and consequently allows you to go faster and faster. 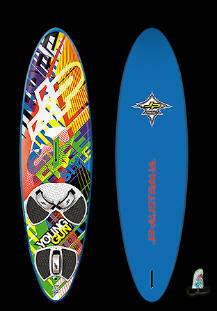 We developed the Young Gun boards with the special needs of the new generation in mind. They come with a reduced stance width and a shorter distance between footstrap plugs for more narrow feet and also with many different footstrap options for youngsters of all sizes and sailing levels. They work for young guns up to around 50 kilos. Made for young beginners and youngsters, who want to get planing, get into the straps and start learning some tricks. A 55 liter version of Kauli Seadi‘s and Jason Polakow’s latest development together with Werner Gnigler – our famous shaper. Approved by Cody Young (best surfer in his age group on Maui). Radical in feeling and at the same time easy to handle. 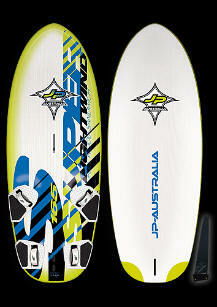 A wave board that works from the shores of Maui to South Africa and anywhere in between. For wave riding young guns and small, light women. Now with Slotbox twinser fins and Minituttle side fins. 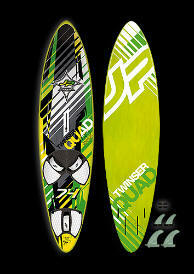 Youp Schmit our two times PWA Youth World Champion has developed this board with Werner. It offers unbelievable pop and is made for the latest and sickest moves. The weapon of choice for any Young Gun looking to be the next world champ! 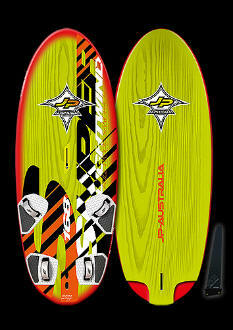 They combine the stability a beginner needs with the sporty planing feel an advanced rider wants. 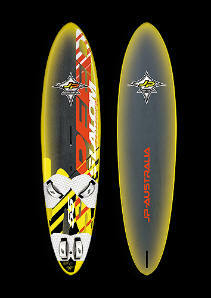 Contrary to wide body beginner boards like the Funsters, the Explorers feature rather narrow and long hulls. As soon as you master the basics of windsurfing they lift up to a glide in light winds instantly offering that ‚Funboard feeling’. Once planing they feel fast, sporty and alive. The high tech drop stitch technology makes the board so stiff that you will easily get it planing but the surface itself is soft enough so that beginners won’t hurt themselves when falling on it. Instead of a daggerboard it comes with an additional center fin which gives the board some directional stability to help avoid drifting and helps to go upwind. Being longer than the normal Explorers also helps with going upwind due to its longer waterline. Our team riders could not believe how much fun this board is. 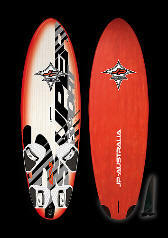 It can also be used as a beginner SUP board and is therefore an ideal family toy. 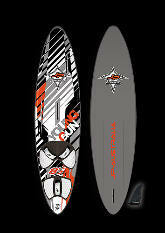 The Windsurf SUP has been specially developed to work equally for both sports and offers an incredible range of fun. 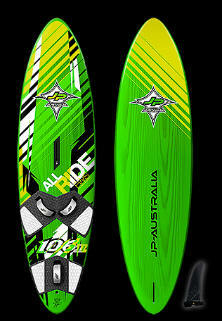 It will get you on the water at any time – for fun, adventure or for a workout – or all together. An ideal family toy! 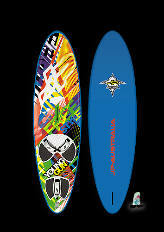 A great SUP and Windsurf beginner board as well as fun board for the advanced SUP’er and Windsurfer. Plenty of length and volume offer extra stability. 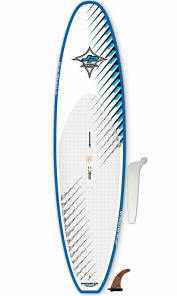 It comes with a fully retractable dagger board, which provides stability and makes it effortless to sail upwind. While it works great for flat-water paddling or a first windsurf session on flat water, it can also be used in small waves – for both sports. 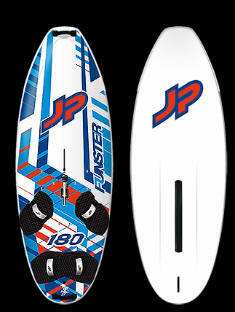 The ultimate plaything for Young Guns who like to have fun in the water. Kids will learn how to paddle around in 2 minutes and will be sailing in and out by themselves within two days. When you see kids, who have never been on an SUP or Windsurf board before, you will be excited by how much fun they have. The dimensions (width, length, volume) and the soft deck technology (no hard edges) combined with the center fin make it a perfect windsurf beginner board for kids up to 50kg. 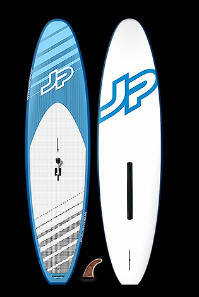 At the same time it is an ultimate all-round kid‘s SUP for flat-water and waves. The boards additionally come with 2 Mini Tuttle plugs to cover the side-fin boxes when used as Twinsers. There is no question that Twinsers and Quads have significant advantages in side shore conditions. All well-known riders have switched to this set-up mainly because of the unbelievable turning of these boards. Kauli, who initiated the Twinser and Quad concept made these boards popular with his own unique style. He has put a lot of effort into the development of the JP range wanting a line of Quads that he can use around the world in all different conditions, not just in pure down-the-line conditions. This range shines in areas where Quads previously did not feel so much at home: Early planing, great speed and upwind performance. 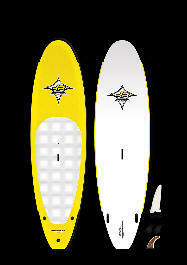 The boards additionally come with 2 Mini Tuttle plugs to cover the side-fin boxes when used as single-fin boards. 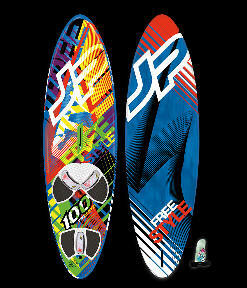 Shaper Werner Gnigler and pro riders Robby Swift and Ricardo Campello have worked on this new line to come up with boards which are incredibly versatile suiting the competitor on the PWA World Tour just as well as the active wave sailor looking for a powerful and fast wave toy. 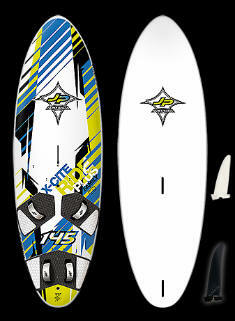 They cover a huge range of use and the popular 3 fin set up gives you lots of tuning options. Not just the choice of using it as a single or tri fin, but also the option to use bigger side fins and a smaller center fin. These tuning options can shift the focus of the board from an onshore rocket to a side shore playmate. Steven van Broeckhoven and shaper Werner Gnigler have developed the three sizes, 90,100 and 106. Two of the sizes were already flawless for today’s powerful double moves and trick combos. These moves require fast and direct boards with explosive pop – even a 2nd and 3rd time – and the 90 and 100 were up to that! Steven and Youp Schmit are more than happy with their feeling and performance. So we left them unchanged. Nevertheless, Steven had the intention to adapt the light air freestyle board not only to fulfill the highest standards of modern freestyle in lighter winds but also to make it feel as radical as its smaller brothers. 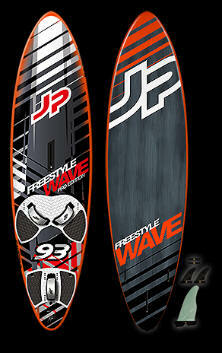 The “All in One” concept between Freestyle Wave and Super Sport. They offer great early planing, a very comfortable ride and fantastic top end speed. Easy and forgiving medium wind jibing boards which deliver an exciting, electric feeling when going fast. 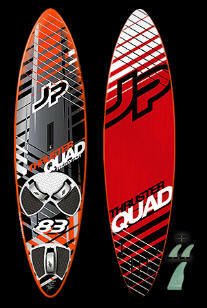 Plug and play windsurfing – jump on and have fun. 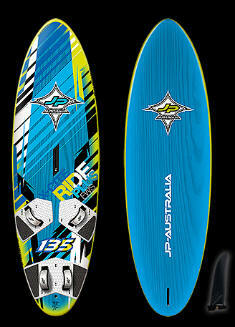 The 116 uses the performance oriented rocker line from the Super Sport range. 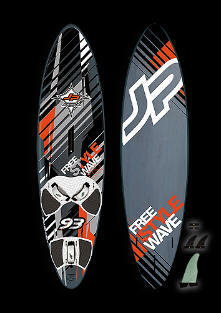 The 96 uses one which is close to the Freestyle Waves. The 106 is a combination of the two. The bottom shape provides Vee in the mid section of the board combined with double concaves. This makes it easy to initiate maneuvers and adjust the radius of the jibe. The Vee in combination with the double concaves just swallow up any chop and provide a supermcomfortable ride. The channel bottom concept provides great performance in early planing, high speed and excellent maneuverability as the rail line has more bottom curve than the inside area of the channel. The channel edge also creates extra lift and grip for maneuvers. The rather straight outline between the foot straps makes the board very stable in straight line sailing and provides even pressure on front and back foot resulting in a very comfortable stance. The deck has a constant radius in the standing area, which means that you always feel connected to the board. The wide tail makes jibing effortless. The board remains controlled and predictable as you enter the jibe. At the middle of the turn a great gliding sensation kicks in. The board remains stable and calm as you go into the foot change. After the rig flip the power comes on smoothly and you accelerate rapidly back to top speed. It almost jibes itself. You only need to initiate the turn and it holds that carving edge – it’s so easy! 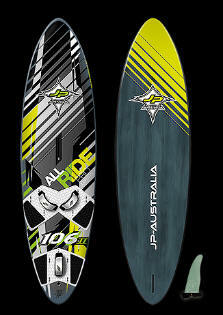 This is an all-new, thrilling and exciting concept of extra wide, short and thin freeride boards within the JP line. It features so far unseen early planing with the easiest jibing possible. The main difference to comparable boards from our competition is, that they really give you an electrifying feel which you normally only get from much smaller boards. Their early planing and top speed is also unmatched in their class. 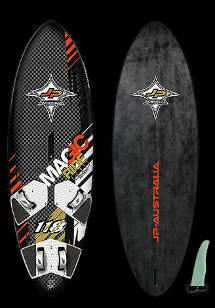 Shaper Werner Gnigler took a lot of features from the Freestyle Wave boards. The thin rails in combination with the low overall thickness make them such outstanding easy jibers. They pretty much jibe by themselves. Push the rail and they will carve the same radius every time - nice and easy. Obviously, the thin rails also provide great grip for more sporty jibes – in case you are up for those. If your jibes are not perfect yet and you sometimes make little mistakes during the maneuver – no problem the Magic Rides will simply finish the jibe for you by keeping the same radius. The wide body concept creates ease, comfort and stability. This in combination with the special rocker line probably makes the boards the ultimate in passive planing today. You don’t need to pump or use a special technique to get them onto a plane. Just sheet in and enjoy! Their planing power is not limited to big sails. They jump on the plane effortlessly - even with rather small sails. Super easy to get going and get into the straps! They accelerate quickly to a convincing pace which is easy to handle and controllable at all times. And they never seem to stop planing! Their amazing maneuverability and their reliability to carve steady arcs inspire to try some classic freestyle moves. Short and wide boards often run into control problems in choppy conditions. Not with the Magic Rides the maximum width is slightly in front of the center resulting in a smooth and even outline which provides enormous control at high speed. They will feel like the smallest boards of this width that you have ever sailed. The Super Sports deliver slalom-like performance but are way easier to ride and control. Great market feedback and lots of test wins have confirmed that. 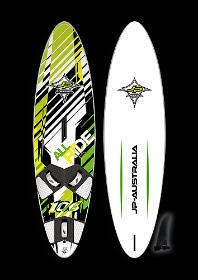 The line combines shape features from the X-Cite Ride and the Slalom boards to offer the best of both worlds. To make them really fast Werner Gnigler used his experience from the slalom developments while the influence of his X-Cite Ride shapes make sure that the power of the Super Sports is easily accessible for everyone not only for World Cup professionals. The reduced overall length gives the boards a lively feel. The volume distribution is very balanced throughout the board which is an essential feature needed for early planing and effortless riding.Werner designed the so-called race deck on these boards. The key factor is the raised deck in the foot strap area combined with a round and constant deck curve in the whole standing area. The stance is very comfortable and you’ll stay connected to the board at all times. The bottom is equipped with a double concave V in the front flowing into a flat V towards the tail, ending with slightly bigger cut-outs. The concaves work like suspension when the board hits chop. The flat V supported by the tail cut-outs have the best and most efficient water release resulting in top speed on every course. 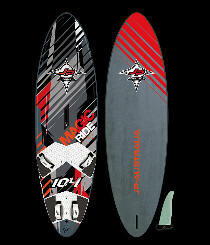 The cut-outs also take some pressure off the tail keeping the board flat on the water – even in the strongest gusts. The outline is kept rather parallel especially at the rear of the board resulting in a powerful stance with even pressure on both feet. Towards the front, the full rail radius creates buoyancy when not planing and balanced lift during carving maneuvers in which the board glides through the jibe on its rail. 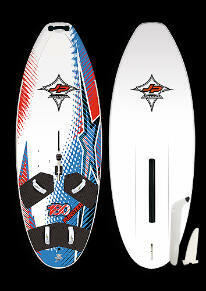 The fins supplied with the boards are probably the best performing Powerbox fins you can get. 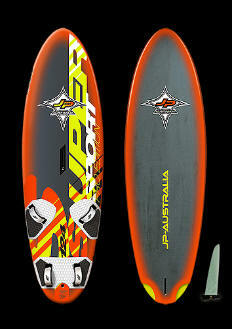 The Super Lightwind boards start planing when there are no white caps in sight – as early as Formula boards, but they are way easier to handle than any Formula board. Getting in and out the straps is no problem and the jibing of the Super Lightwinds is also a pleasure compared to any Formula board. They are quite a bit longer longer than Formula boards to get planing very early and easily without the special technique of Formula sailors. It also makes the boards more stable in non-planing conditions. Since you will be making long high speed runs with them we used the scoop rocker lines from our big Slalom boards. They are not quite as wide as a formula board (100 cm) so we managed to achieve big advantages in handling. 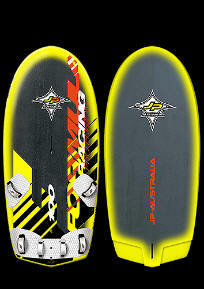 The rail shape in combination with the race deck provides a very comfortable sailing stance. 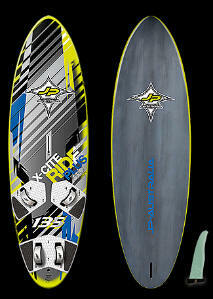 The strap positions come from the Super Sport (SLW90) and X-Cite Ride (SLW 92) boards respectively. They jibe relatively easy for such wide boards and stay on the plane through the turn. We achieved this by using a special V flow concept. More V in the mid section of the board where it’s much wider makes it easier to rail the board up and initiate the turn. To guarantee maximum control during high speed runs we reduced the V towards the tail. We also used big tail cut outs for better release and a looser feel of the boards. 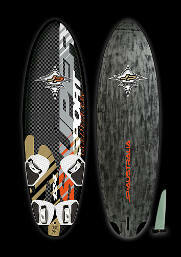 The board shapes in combination with the 56cm molded Carbon fin make them real pleasure boards for reaching. As the name says, the all-new Speed Slalom offers the great combination of a lightwind speed board and a full-on slalom race board. It features a double concave front section with soft tuck rail for a smooth ride over chop. This makes the boards immune from getting pushed off course by side chop. Towards the tail the bottom transforms into a flat V, which increases slightly towards the tail. This produces minimum drag and gives the board that loose feel. In addition to the 59, which is our highwind board, we offer a powerful quiver (68 and 84) for the rider who prefers wider boards, and also the slightly narrower line (66 and 80) which offer outstanding top speed and control. 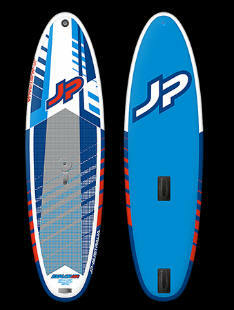 The 66 and 80 are new shapes that push the performance of slalom boards to a new level. Our new ‘bottom concept’, where the V flow increases constantly towards the tail, gives you a better release and a higher top speed. Maximum speed in a straight line is not enough anymore. The boards need to feel lively and light under your feet. You need the feeling of flying over the water and not the impression of pushing through the water. Additional outline curve at the tail delivers that feeling and performance advantage. Normally this change would result in a less powerful standing position and less acceleration. This is not the case with our unique looking new deck shape. A deck winger makes the deck outline wider than the bottom one. This supports you with a more outboard stance producing more power in light winds and maximum control and comfort on long runs. We developed a new board by merging the former Power and Speed. 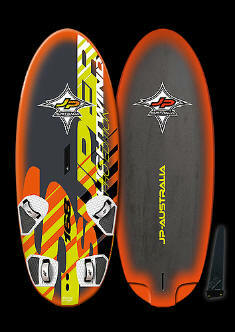 In choppy conditions you permanently need to trim and level out the board in order to get maximum speed. 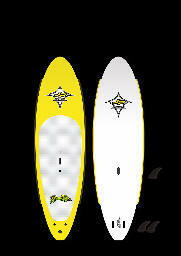 We added some outline curve at the tail making it easier to find the ideal water position of the board. Due to the new outline it feels looser under your feet, so it is easy to keep it ‘flying’. It powers up straight away and flies over the fin. It is so balanced and well trimmed that it is easy to keep the pressure on the fin, and soar upwind. The wide tail creates plenty of power that is instantly converted into lift to enable upwind sailing. At the same time it’s easy to release all that power and transfer it into maximum speed. We achieved this with a new progressive bottom V-flow that also makes it accelerate to unknown speeds on the downwind course. It also takes pressure off your legs making it easy to handle all this lift, and consequently allows you to go faster and faster. 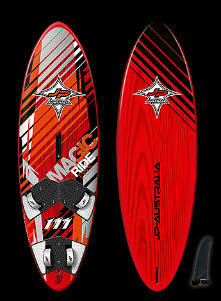 A winner in all waters and conditions, this board is fast and controllable, meaning it clearly outperforms its predecessors and shall dominate the Formula scene. A 55 liter version of Kauli Seadi’s and Jason Polakow’s latest development together with Werner Gnigler – our famous shaper. Approved by Cody Young (best surfer in his age group on Maui). Radical in feeling and at the same time easy to handle. 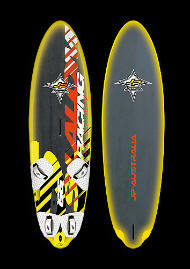 A wave board that works from the shores of Maui to South Africa and anywhere in between. For wave riding young guns and small, light women. The All-In-One board for the advanced youngster. As soon as you have grown out of the Young Gun 115 you are ready for the 85. 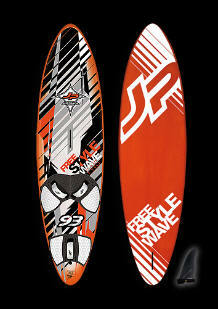 A small version of the Freestyle Wave boards that works for freeride, bump & jump, freestyle and waves. The Explorers combine the stability a beginner needs with the sporty planing feel an advanced rider wants to enjoy. 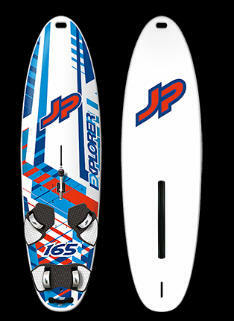 Contrary to wide body beginner boards like the Funsters, the Explorers feature rather narrow and long hulls. As soon as you slightly advance and master the basics of windsurfing the Explorer lifts up to a glide in light winds instantly offering that ‘Funboard feeling’. 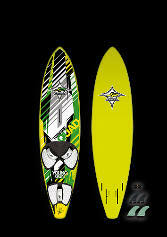 Once planing it is and feels much faster, more sporty and alive than wide body beginner boards. With this board touring, exploring and enjoying the coastline is a great experience. They deliver outstanding performance – considering they are also great beginner boards. When planing, they almost feel as sporty as an X-Cite Ride, lifting on their tail and powering off their fin. 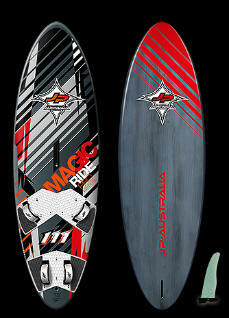 A great sensation especially for a board that comes with a daggerboard. On wide body boards the daggerboard basically only reduces the sideway drift. 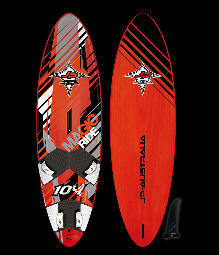 On the more narrow Explorers, the power of the daggerboard can lift the windward rail, providing an exciting feeling. This makes it a lot more fun to ride with the daggerboard in light winds and is more efficient to go upwind. They come with many foot strap options for every rider level, starting from the foot strap beginner to the advanced rider who is already able to use the straps and push the board to accelerate. Because of the retractable daggerboard and the various foot strap options everyone will find the perfect set-up. 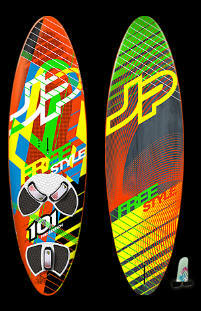 The volume is evenly spread-out and gives plenty of stability for first time windsurfers. 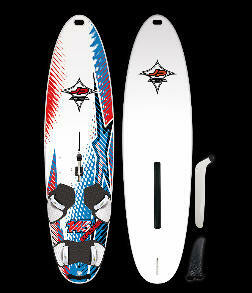 The built-in nose handle in combination with the strap handle at the tail make carrying the board really easy. The soft EVA deck makes them ideal for every member of the family. 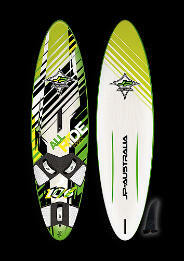 The Funsters combine the easy handling of a super stable beginner board with the performance of a larger freeride board. They are excellent beginner and family boards. Advanced riders can also have fun on them. 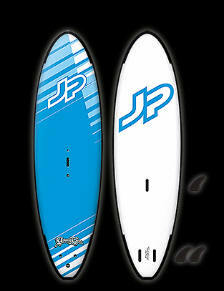 The 205 and 180 are simply perfect beginner boards. After only a few hours everybody will be sailing back and forth, and will quickly reach the thrill of planing. The mast track is centered and very close to the dagger board, making the board reactquickly to rig and foot steering. 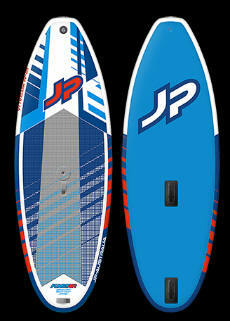 All JP SUPs can additionally be used for Windsurfing (with the exception of the Race boards). 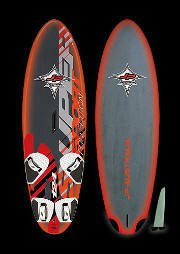 The Windsurf SUPs have been especially developed to equally work for both Sports and offer an incredible range of fun. They all come either with a centerfin or a daggerboard for additional stability when windsurfing and to avoid drifting sideways during these very first hours of your windsurfing career. 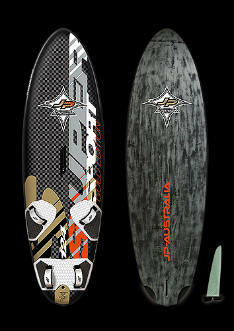 These boards get you on the water at any time – for fun, adventure or for a workout – or all together.